Expired domains are becoming increasingly valuable in the SEO world and being able to sift through them quickly by checking how many editorial links they have is invaluable. While domain authority can be very useful, it’s sometimes accurate. It’s entirely possible to have an expired domain with a domain authority of 10 or 15 but have 3 or 4 editorial links that carry serious link juice. If you watch my videos on YouTube, you know I hate on metrics often. Even trust flow isn’t that great. The amount of sites that I’ve ranked with PBN domains with a trust flow under 5 is absolutely ludicrous. While everyone is out hunting for those spammed PBN domains with TF20+, I’m grabbing all the good stuff under the radar and finding some expired domains with some seriously undervalued backlink profiles. Majestic’s trust flow is good to judge spam. Moz’s domain authority is better to judge link power. More on this in my videos. I coded a tool that checks the Moz domain authority of a list of domains, and also counts the editorial links for each domain. This software is very useful if you’re hunting for expired domains yourself, rather than hiring it out. The software only works on Windows, as most of my desktop software does. If you’re also a Mac user like myself, you can use this, or pick up a cheap Windows computer to run your software, like I do. Fill out your info here to have the software emailed to you. Everything here is free. You can use a free Moz account, instead of your main. 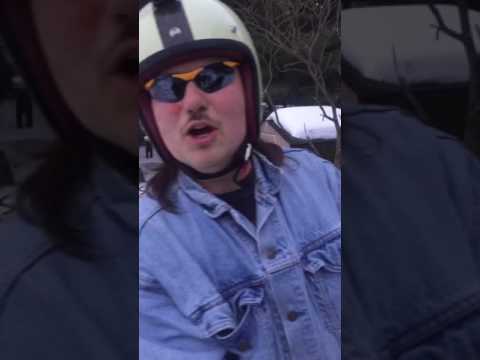 If you have any problems, please reply in the comments below. Emails regarding free software are ignored as I just get way too many emails in a day to try to respond to everyone who needs help. As always, there is pay per minute consultation available on the contact page if you need anything. 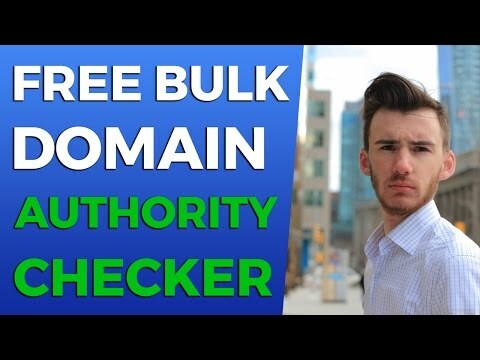 If this domain authority checker and editorial backlink counter helped you in anyway, please let me know in the comments. This blog is mainly dedicated to more advanced techniques, however here is an introductory rundown for those new to the space. So you’re a small business, and you have a website, but you want to rank higher on Google. This process is called search engine optimization, or SEO. Since 2009, I’ve been studying the hundreds of factors that affect the rankings. I’m now going to summarize a few points that I have for small businesses who are just starting to get interested in SEO. You need to check if your website is indexed at all by Google. Simply use the search query below to check if your site is indexed. If your website comes up, you’re safe. If it doesn’t display any results, then you need to submit it here. This is mainly just for new websites. Start with submitting your website to Google Maps. Then add it to YellowPages, Yelp and any other speciality directory that applies. If you run a dog kennel, maybe search “dog kennel directory.” This may bring direct traffic to your business, but the main focus here is links and mentions of your website name. The more mentions, the higher you will rank, essentially. It’s more complicated than this, but it’s all you need to understand. I’m not asking you to become a social rockstar, but if you can start up a Facebook page, get 50 likes and post a photo once a month, Google will be able to determine that you’re a legit business. Word count and word relevancy is very important on your website. If you want to rank for the phrase “Toronto corporate law firm” then you need to mention each of those 4 words in your homepage article, at least once or twice. You also want to have as many words as you possibly can. 300 is enough, but 500 words should be your goal. I’ve seen the best businesses hit even more words. Once you’re on Google Maps, it’s very helpful to have a few reviews, again to prove you’re a legit business. 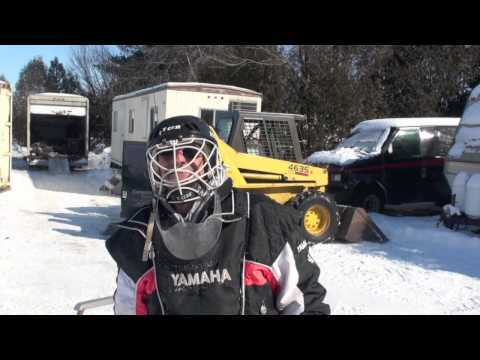 I manage the SEO strategy for a very large motorsports rental company and over the years, we have built up to over 80 reviews on Google Maps. We are one of the most-reviewed companies in that industry in Canada and are ranking #1. You want other companies in your industry to link to your website. If you’re a restaurant, and you often recommend a local comedy club, you guys should link to each other. You can have a “partners” page and link to the comedy club and they will reciprocate. This is one example, but there are many ways to get links to your site. Google values links to your website. My Twitter has thousands of real followers which I have obtained through a number of ways. People tend to claim they are “social media expert” but I wouldn’t consider myself an expert. I just understand the system. Here are a few tips to get you to my level of engagement. People will forget who you are if you don’t post daily on Twitter. I like to hit a minimum of 3-4 tweets a week, but my aim is 2-3 a day. If you get too many thoughts in one day, save them as drafts and post them on a day when you don’t have the creativity or time to craft tweets. You can schedule tweets, but I don’t. I like to tweet anytime from 9 AM to midnight. You could post earlier. People are always on Twitter at night, so that’s a safe bet. Links are the spam of Twitter. Unless the link is of direct benefit to you, do not post it. Do not share interesting articles. Instead, take a screenshot of a good paragraph, crop it, and post that. See next point about images. I don’t get that great of results with images. Post them if they’re really good, but do not post many. Probably 1 out of 30 tweets of mine are images. This is the same as links. Retweets can be viewed as spam. You want people to retweet you. Do not shove content in your audience’s face unless it’s of benefit to you. You do not get any benefits unless it’s a friend’s tweet, etc. Retweets don’t benefit you as much as you think they do. This world is in need of creative and original thinking. Twitter is spammed with popular quotes. Instead, try to make up your own quotes and explain yourself. Craft a specific way of thinking for your followers. My most engaged and popular tweets are simply random thoughts that I came up with. A popular tweet of mine, containing advice that I came up with throughout my day. I use Twitter as a producer, not as a consumer. I do not view other people’s tweets, unless I look on a specific person’s timeline. I never view the newsfeed. That’s why I am not worried that I follow 5,000 people. I follow people because it makes them feel good and makes them engage in my content and retweet me. It’s these people that power every tweet to thousands of people using retweets, so following them is the least I can do. If you’re going to automated this, make sure you automatically unfollow others so your following count is always less than your follower count. 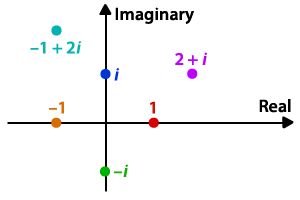 I named this post imaginary value based off the idea of imaginary numbers. Just because the additional earnings and value accumulated that we are about to talk about are not real or tangible at this point, it doesn’t mean they don’t exist. Ok Josh, you’re off your rocker. What are you talking about?! One of the first things most beginners miss is the increase in company value. Let’s assume your company is worth 12 times monthly net profit. So now after 1 year, you have a $24,000 company. So if you sell out, you actually made approx. $48,000. Then, you have things like the brand name. You won’t always own the brand but it will always be attached to your résumé. If the company takes off after you sell it, that résumé item really holds a lot of value. By résumé, I don’t just mean applying for jobs, but it will allow you to get media coverage, and if it was big enough, maybe even a book deal! If you replicated the process of building a similar company a couple more times, you could even write a book or create a course on it. You’ll have 3 brand names (that you may or may not own anymore) that you can mention in your sale pitch. Then you have what you learned. Experience is one of the best forms of education. You can take what you just learned, and apply it on a bigger idea next time. After each success, your chance of success increases. You know the process. You’re much less naive. It’s like my good friend Don tells me, your first million is always the hardest. Another form of imaginary value is the connections you make. Your business likely made new connections with suppliers, freelancers, investors and many forms of people who can add value to your business. I personally owe a large portion of my success to mentors — not paid mentors but more experience people who lend advice once a month. With these people now added to my life, every aspect of my future projects will be better off with their opinion. This blog is mostly about internet marketing, but school plays a bit part of my life, so I’m going to share a bit of my experience over the past few years. 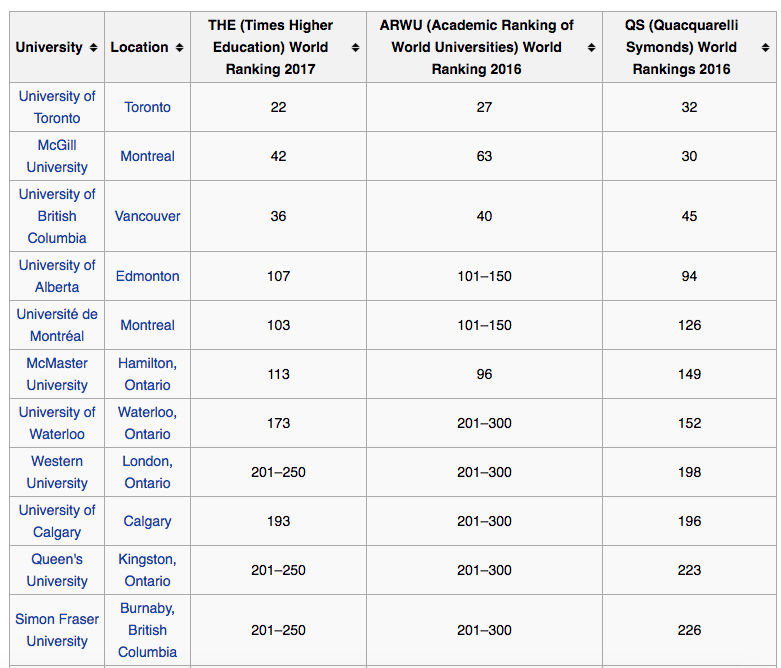 I go to University of Toronto, which is the top university overall in Canada. Getting a degree here is money in the hands. Below is the top few universities, by ranking. So, to even get into such a competitive university, you need to have good grades. Some programs you don’t need a 90% or 95%, but rather an 85%, which is still an A or A-. 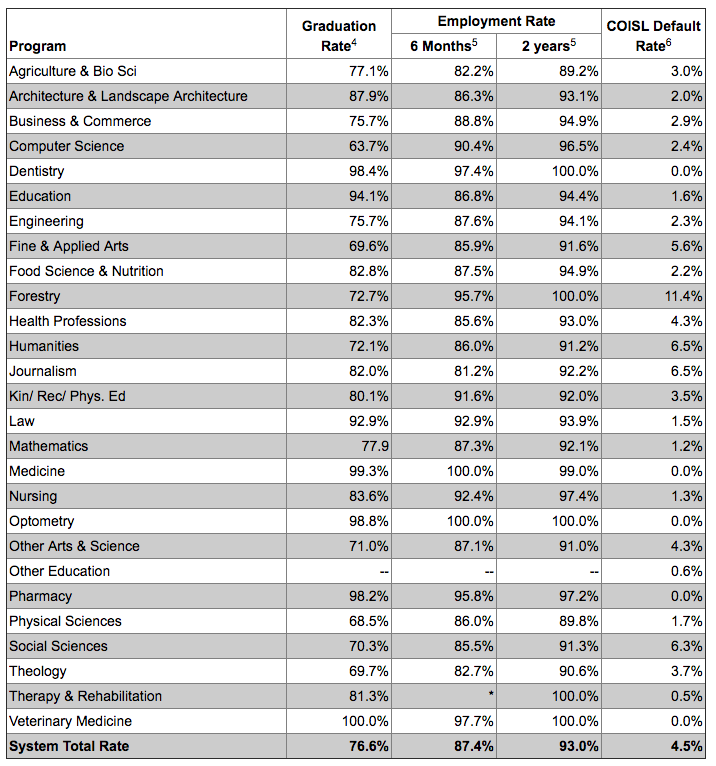 So let’s say with an 85% average from high school, going into first year, you’re already in the top — say 20% of all students your age. Now, let’s apply some statistics. I’m in computer science. So my graduation rate is 64%. Now I’m in the top 7%, if I’m still standing after 4 years. Okay, now lets apply the fact that where I am right now, I’m one of the few taking tough 4th year computer science, because many people opt for another kind of degree. This part is complicated, but let’s just say I’m taking a course on database management systems, out of choice. So cut another chunk off that percentage. So the first midterm comes back, and the average is 50.62%. It’s a passing average. If your GPA is below 65%, you get put on academic probation. If it stays below 65% for a second semester, you get a 12 month suspension. So now, about half of your class sees their mark, and they drop the course. They either will try it again later, drop out, get suspended by failing a different course, etc. So take that previous percentage and cut it in half. This takes us down to almost 1%. After half the class drops (usually the bottom half) the average goes up, because the people holding it down are no longer there. Now the class average is in the 60s, maybe 65%. The administration see the average was sufficient at the end of the semester (because those who couldn’t make it, dropped it) and nothing is done about it. Let’s not forget that the people who are holding that 50% average down are still highly intelligent individuals. They’ve made it this far. They’re all top students in their high school computer science classes, but when pooled all together, they’re all average. This is exactly what they do with the unemployment rate — they dont factor in those out of the job market entirely. 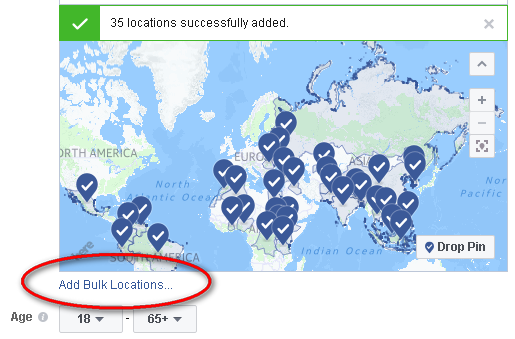 Facebook doesn’t have the option to target all countries, so you have to manually enter them — until now, when they added the bulk import option. I don’t know how new this feature is, but I do ads a few times per week and I just noticed it. They used to have a limit of 25 countries, but that seems to be gone as of now. If you want to target all the wealthy countries in the world, or if you want to target all the poor countries, you have to import a list. Luckily, I’ve done this enough times, that I’ve already sorted countries out by GDP, etc. Here is my list of countries with a GDP over $10,000 and sorted by population descending. This is a guest post. To submit a guest post, send me an email. Internet marketing often times comes down to networking and Twitter is a great way to do that on a personal level. Usually business owners manage their own Twitter accounts unlike official Facebook pages for a company. A great blog backed by a legendary SEO tool. You can expect frequent tweets of case studies, tutorials, and other industry insights. The information presented is well thought out and by multiple authors, thus allowing you to learn from multiple people. A syndicated news agency dedicated to search engine news exclusively. If you’re an SEO it’s a great place to learn the latest as it pertains to search engines. They were established in 2008 and have a long history of breaking Google related news stories. Co-founder of one of the largest web brokers on the net – Thomas Smale tweets about the state of online real estate. From website evaluation guides to start up news, you can get it from Thomas’ Twitter handle. Known by some as the knowledge guy. A great source of tips on self-empowerment that touches lightly on the Internet Marketing industry. If you would like a refreshing break from data crunching this is a great follow. A relatively new blog by Entrepreneur Joe Mongan. It covers everything from industry news to in-depth tutorials that show you how to make money online. IMPULP is known for its bold truth telling journalism. If you like news that reaches out and grabs you, this follow is for you. The man famous for creating Hello Bar and Kissmetrics – Neil is a great person to follow for a mix of “how to” blog post. His case studies are some of the best in the industry covering every aspect of blogging and user experience. A tell it like it is entrepreneur, author, and hustler. Gary is famous for his new book #ASKGARYVEE which is a great read. Follow him for uplifting Tweets that highlight the true sense of what it means to be successful in life. That’s it! Go follow these top 7 people now to make your Twitter experience better. If you have people you recommend my readers follow just comment below with a link to their Twitter handle and we might include it. Software To Prune Inactive Instagram Followers? It’s a problem many Instagram marketers get into. You build up a clients account and you get to 10,000 followers, but the problem is, you’re only getting a couple hundred likes. Your engagement is way down now due to Instagram’s new newsfeed algorithm that tries to determine the more relevant media to show. Now your account just looks silly due to the low engagement. Even though your 10,000 followers are real people, few of them ever like and some of them don’t even use Instagram anymore. Additionally, some people purchase Instagram followers and regret it down the road. The question is, how do I delete Instagram followers? Goes through your past dozen or two dozen photos and gets the usernames of the likers. How far you scrape depends on the activity of your account. Personally, I post about 3 times monthly, so a dozen of my most recent photos would be enough. Then, it merges the usernames into a file, removes the duplicates and then you add in all of your followings (friends, famly, etc) which would be another couple hundred people. We will call this, our whitelist. Next we build a second list by scraping all of our followers. Then, we take the list of followers, subtract the whitelist and now we have a list of people to unfollow. Lastly, we simply block and then unblock the people in that list, which will remove them as a follower. For the time being, I’m going to code a script to do this, but if anyone runs into a similar problem where they want to get rid of inactive Instagram followers, don’t hesitate to reach out in case I make a commercial version or service. There are many of you who are using rank trackers already, so this post isn’t really for you. However, there are a few who have not yet jumped onto a tracking service. I’m not going to recommend a service in this post, just because this is not supposed to be an affiliate or promotional post, but rather an informational post. You have so many keywords, URLs and days. Multiply all these out and you have thousands of data points and it’s hard to visualize what works and what doesn’t without a rank tracker. With a rank tracker, you can see which keywords are improving, which are not, which are steady and how long they’ve been like this. Day to day, it feels like some of my keywords never move, but then I realize I’m at #3, when I was #120 for a highly competitive term just 12 months ago. If you don’t have a rank tracker yet, you’re causing yourself stress and disorganization and you should jump on one immediately. There are many affordable options on the market and some even have a free tier, or trial. While this isn’t a marketing blog post, this is a post that heavily describes what it’s like in Canada, for the many of those who ask me. 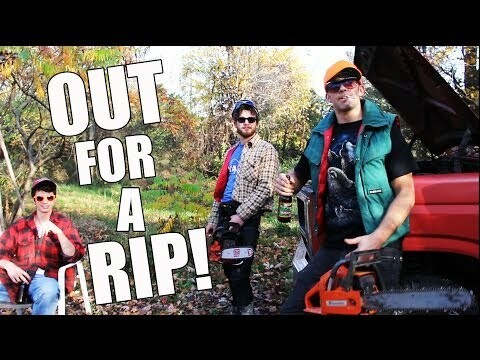 Here are 3 viral YouTube channels that explain where I grew up in Canada.